Third round of World Sudoku Championships. was name Two to Tango. It contains Hybrid Sudoku puzzles. It means that Sudoku puzzles in this round was mix of two very well know Sudoku puzzles. Today I am going to post my 350th Sudoku puzzles in Fun With Sudoku Series. So I thought to create Hybrid Sudoku with the mix of Thermometer Sudoku and Arrow Sudoku. Theme of this Thermo Arrow Sudoku is 350 representing my 350th post in Fun With Sudoku Series. Standard Sudoku Rules apply. Additionally both Thermo Sudoku Rules and Arrow Sudoku Rules apply. Some thermometer shapes are in the grid. Digits must be strictly increasing from the round bulb to the flat end. The number placed in a cell with a circle must be the sum of the numbers placed in cells the adjoining arrow passes through. Numbers may repeat on arrows. 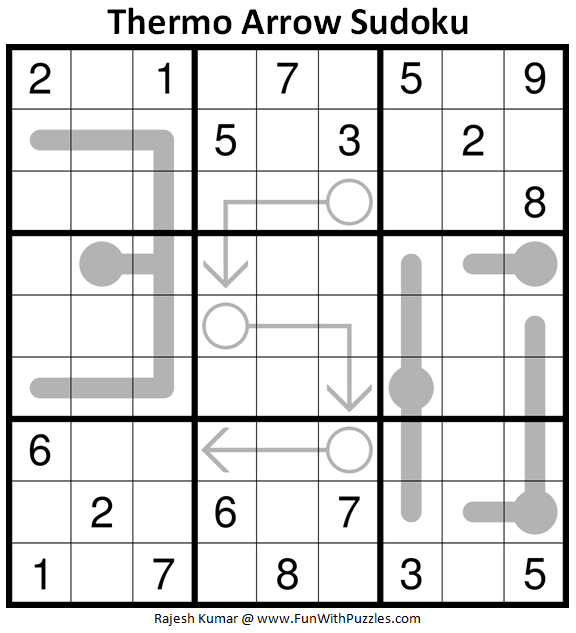 Answer of this Thermo Arrow Sudoku puzzle can be viewed by clicking on button. Please do give your best try to solve this Sudoku puzzle before looking at the answer. 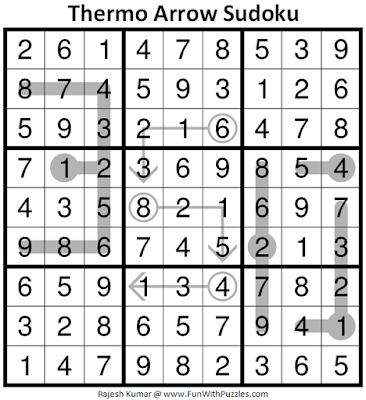 This Thermo Arrow Sudoku Puzzle I am publishing as #350th Sudoku puzzle in Fun With Sudoku Series. Here are the next and previous Sudoku puzzles published in this series. 12:39.Not as difficult as the time suggests as I missed some fairly easy deductions but definitely a good one. 9:30, smooth solve. Visually appealing construction. Congratulations Rajesh for 350 Sudokus. I really enjoy solving your puzzles. I always look forward for your feedback regarding my Sudoku puzzles.